As Internet connection speed getting faster, more and more people tend to embrace cloud service. Any desktop applications could be transformed to cloud applications with better maintainability, security, and stability. End-users can use web browsers to get connected with social friends, store tons of personal data, watch live video, edit documents, publish blog posts and even write code. In this article, we will take a glimpse of how to make Dynamic Barcode Reader SDK work with web technologies. You will see a cloud-based barcode scanner that consists of a webcam, HTML5-supported web browser, IIS web server, and .NET barcode reader SDK. Accurate: reads barcodes within a specified area of a selected image. Effective: reads multiple barcodes in one image. Powerful: reads poor quality and damaged barcodes. Flexible: detects barcode at any orientation and rotation angle. Microsoft Edge, Firefox, Chrome, and Opera. Open Visual Studio to create a new web project. Click References to import Dynamsoft.BarcodeReader.dll. 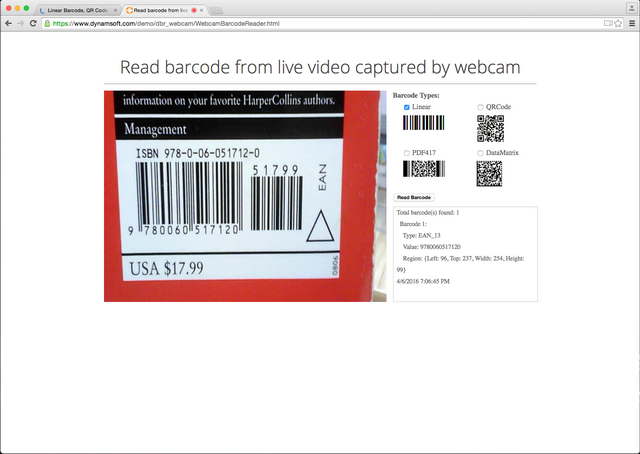 Interested in the above-mentioned webcam barcode scanner demo? Download the 30-day free trial of Dynamic Barcode Reader to build your barcode applications. Dynamsoft Barcode Reader SDK is not only available for Windows, but also for Linux and Mac OS X. You can have fun with it on your favorite platform. If you have any questions, please feel free to contact support@dynamsoft.com.